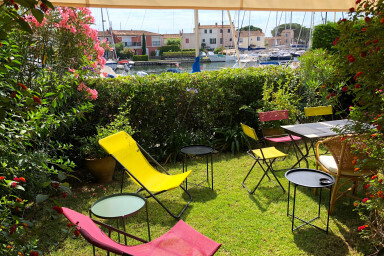 A large garden to enjoy the sun and the stillness of Port Grimaud! This spacious apartment on the ground floor has both a terrace with archs and a garden with a view on the canal. It is about 5-minute far by walk from the center. It is composed of an entrance, a living-room with a sofa-bad and an open kitchen, a large bedroom with 2 single beds that can be kept separate to joined and a shower-room. Both the living-room and the bedroom give access to the terrace. Beautiful view on the canal of Port Grimaud and the boats. A nice apartment to enjoy holidays and relax!